What’s the first thing most people do when they want to lose weight? Generally speaking it’s going to fall in to two categories. They either go on a ‘diet’ or they begin an exercise regime. The way you approach running to lose weight will vary in a couple of ways if your aim is to burn off body fat as opposed to becoming fitter. The same basic principles still apply in that you'll need to start off gradually and build up your mileage and length of sessions over a period of time. You’ll also need to be consistent in your workouts as you would if you were trying to become a better runner. But the biggest differences are in the things you eat and the time of day you run in relation to the meals you consume. If your goal is to become fitter and you have no concerns about running to lose weight, then you should eat a little more every day to fuel your exercise. It will make a big difference to your training if you consume higher levels of carbohydrates than normal because this ensures that your glycogen levels are as full as they can be, meaning you have a much larger energy supply from which to draw upon. However, if you’re starting to run in order to lose weight, it will be of great benefit to you to reduce the amount of carbohydrates you eat generally because this depletes your energy stores, meaning that you’re more likely to use your own body fat as an energy source to fuel your training. The early evening is perhaps the best time to run if you are purely interested in getting fitter because at that time of the day, your muscles, connective tissues, heart and lungs and internal organs are at their most efficient and you’ll be burning off the calories you’ve stored during the course of the day. However if weight loss is your only goal, you ought to consider training first thing in the morning. The reason for this is because at this time of day, the glycogen levels in your muscles are low and your body is then forced in to burning more of its own fat stores to provide energy. Finally it’s always a good idea to have a meal that's high in carbohydrates immediately after running to quickly replace glycogen stores and help the recovery process. However when you’re trying to lose weight, you should only have a small amount of carbohydrates afterwards because then your body will continue to burn mainly body fat until your metabolic rate slows down again. 1. As a beginner, do you know how hard you should be working and how long each running session should last for? 2. Do you know of at least 3 advanced training techniques that you can use regularly to sky rocket your fitness levels? 3. Do you know which foods boost energy levels, making you feel great and helping you to keep going for longer? 4. Do you know how to create your own running schedule so you burn fat fast and get fit? 5. Do you know when to push yourself and when to hold back to avoid getting bored or picking up niggling injuries? 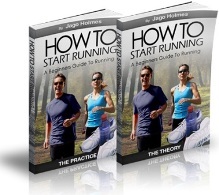 If you answered 'no' more than 'yes', then you need 'How To Start Running'- a fantastic NEW running guide for beginners. You'll Also Receive Our Free Running Tips eNewsletter, Sent To Your Inbox Every 2 Weeks - Plus a Very Special and Exclusive Offer Just For You!